Every year, on a night in September, hundreds of students pour into the Harvard Art Museums for the Student Late Night. Last week’s was the last I’ll attend as an undergrad, and in my list of remarkable Harvard experiences, this event is one I’ll miss the most. Student Late Nights are a chance to mingle with Degas, Pollack, or other students, all while sipping brightly colored mocktails and nibbling sweet snacks. The intimate visit highlights the unique access Harvard students have to the museums’ premier art collection — access that includes opportunities to listen in on artist talks or even, as I did, rent a signed Warhol print for their bedroom. This year, as more than 1,200 students strolled the Renzo Piano-designed building on Quincy Street, Ejin Jeong ’22 spent part of the evening looking at one of Degas’ ballerinas. 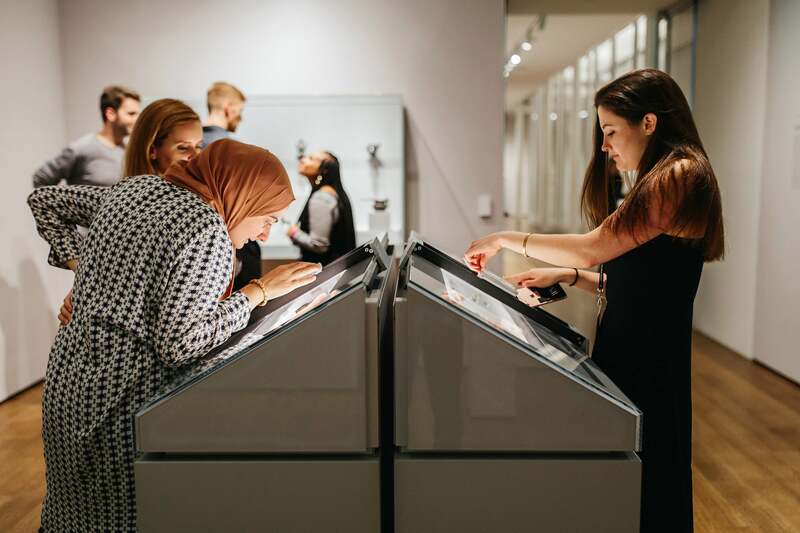 The Late Nights are meant to jumpstart the student-museum relationship by letting students know all the ways they can get involved in the museums. Ali, for instance, is a tour guide, and has spent a considerable amount of her Harvard career at the museums. While attending Late Night, Ezra Lebovitz '22 takes the opportunity to pose with Renée Sintenis’ “Daphne” as fellow student Rachel Chen looks on. Maia Suazo-Maler, a senior concentrating in history of art and architecture, got involved by curating some of the pieces on view last week. After taking a neuroaesthetics class this past fall, she worked with Professor Nancy Etcoff to select objects to display in the University Teaching Gallery this semester as the course runs again. “It was cool to have the opportunity to not only select the works but also orient them within the space, and have a go at creating a small narrative and trying my hand at curation,” said Suazo-Maler. Student Late Night had made a strong impression on Suazo-Maler from her first semester at Harvard. 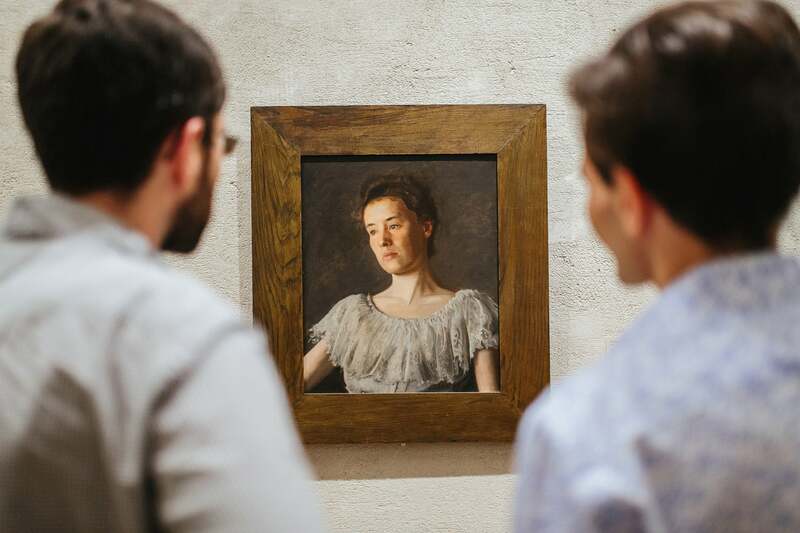 “If you don’t have time to go to the art museums because you’re an athlete or because of your class schedule, to have this Late Night opportunity really demonstrates how the Harvard Art Museums is catered toward the student as the first and foremost audience,” she said. This porous boundary between student body and the Harvard Art Museums has given me some of my best memories as a student. Each of my years at Harvard has looked different: A new class enters, my dorm room changes, campus reinvents itself in some way. But Max Beckmann’s self-portrait has hung on the same wall of the museums since I was a freshman in 2015, and I can find the same sweeping views of Cambridge on the fourth floor. And after I graduate, though I won’t be able to keep coming to Late Night, I know that there’s a chair in the Calderwood Courtyard open for me, and familiar works will continue to line the walls. Rebecca Dolan is a Harvard senior concentrating in English.